HFk: There is a lot of history in your work, especially Sandman and 1602. It is obviously a subject you are interested in? Neil Gaiman: I love history, but I didn’t discover that I loved it until well after I left school. I read a great book called “A Distant Mirror” by Barbara Wertheim Tuchman, which is about how you could see the 20th century in the 14th century. I just fell in love with the detail. There is a well known saying that the past is a foreign country, but it is so real, and can be much like the present. When I was writing Sandman there were, as you say, some historical elements, and it was then that I discovered the joy of research. There is a Sandman story in “The Doll’s House” which begins in 1389, and continues in 1489, then 1589, 1689, 1789, and finally 1989. It was so much fun gathering together the information about what the changing fashions would be and what kind of thing we were doing. That was the time I discovered that it’s all so much fun. HFk: Why did you choose 1602 as the period for the Marvel comic, rather than, say 1502 or 1702? Neil Gaiman: I loved the idea of the Elizabethan period because I could draw parallels. I could draw a parallel between Fury and the Elizabethan spymaster, and similarly Dr Strange parallels John Dee. Then there was the inquisition, and James I, who was famously anti-witchcraft, and I could build in a metaphor that mutants would be perceived as witch people. Also there were things that I needed socially to work. I liked that we were pre technology but post rationality. We were in a world where people were starting to think their way out of trouble and into more trouble. It seemed to me that if I had set it even fifty years later it would have just been a bit wrong. I didn’t want Newton around, and I wanted it pre Royal Society and pre industrial revolution. Also, with it being so soon after 9/11 when I was writing, I had America on my mind. I got to play with the idea of America. HFk: Speaking of which, did you hear that Marvel killed off Captain America last year? HFk: I was quite cross on your behalf when I heard that, because it rather contradicts certain events in 1602. Neil Gaiman: Well thank you. However, I have been around in the world of comics for a long time now, and I know that nobody is dead unless you see the bullet enter them, and the body go through a meat grinder. Even then, in fact, if you wait long enough there’s a good chance they’ll get better. HFk: Actually, I think you are right. I checked on Wikipedia and it looks as though he might be alive again now. He was dead for about a year, but I guess it didn’t take. So 1602 makes sense again! Neil Gaiman: Everybody comes back. HFk: Do you have any intentions of going back to the 1602 story? Neil Gaiman: There are so many things I would like to do, but there is not enough time. I did imagine that if ever I did do a sequel I was going to call it 2061, which would be set in that particular future. HFk: There were some sequels to 1602 written by other writers, did you see them? Neil Gaiman: Yes, they were okay. They did some things that I hadn’t done because I couldn’t figure out how to do them, such as Iron man. I thought that they only way you could do iron man properly in that time period would be with steam power. Of course, if you did that, you would end up with a cooked human being. HFk: You mention you did a lot of research for the book, are there many obscure historical references scattered through it that a lot of people might not notice? Neil Gaiman: The strangest one was Virginia Dare – this girl from the lost Roanoke Colony was indeed the first white girl born in America. There is this very strange legend about Virginia Dare, that she transformed into a white deer. A native American warrior is said to have hunted the deer, and when he caught it, 20 years after the colony fell, it transformed back into a white girl, and the last thing she said was “Virginia Dare”. HFk: Did discovering this legend drive the way the plot developed in 1602? Neil Gaiman: It did. The glory is that whatever you research is going to work its way into what you make up. The other really weird thing about historical research is that it always feels to me that whatever you need is there. I remember doing the “Three Septembers and a January” story for Sandman, about Emperor Norton , a mad-man in 19th century San Francisco who proclaimed himself Emperor of America. An idea I had was that it would be fun to give him a Chinese grand vizier, just because it was set in San Francisco, and because I wanted to remind people about China of that time. When I researched it and read Norton’s biography I was delighted and bemused to discovered that he actually did have a Chinese vizier named Ah How. HFk: You also write children’s books of course. I wanted to tell you how much I enjoyed reading “The Day I Swapped my Dad for Two Goldfish” to my 4 year old daughter. The expression on her face when the idea hit her that someone had swapped their dad was priceless. 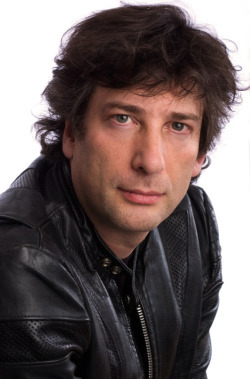 Neil Gaiman: (laughs) I love doing children’s fiction. It would be very very easy to do almost nothing but children’s fiction, it’s so much fun. HFk: Any plans to do anything else historical in the future? Neil Gaiman: In “The Graveyard Book”, which is my most recent book for adults and children, the fact it was set in a graveyard means we have characters from all sorts of historical periods. I loved the fact that the oldest inhabitant (or actually, as we discover, the second oldest inhabitant) is a Roman, buried at the side of what was once a little temple on a hill. HFk: Finally, I have heard a rumour that you are involved with the next series of Dr Who? Neil Gaiman: Yes I am. The only thing I am allowed to say about it though, is that it will most likely be episode three of the next (2011) series. HFk: Neil, thank you very much for your time. UPDATE 2011: Neil's Dr Who episode was "The Doctor's Wife" and was actually episode 4 of series 6. The story was set mainly on a junkyard planet, and revolved around a beautiful woman who has become possessed by the soul of the TARDIS. It was brilliant.